The Hall of Famer died at his home in Oakland, the team said. The cause of death was not immediately disclosed. Davis was one of the most important figures in pro football history from his role in the development of the AFL, the merger with the NFL and the success he built on the field with the Raiders. "Al Davis's passion for football and his influence on the game were extraordinary," Commissioner Roger Goodell said. "He defined the Raiders and contributed to pro football at every level. The respect he commanded was evident in the way that people listened carefully every time he spoke. He is a true legend of the game whose impact and legacy will forever be part of the NFL." Davis was also a litigious gadfly. That was most evident during the 1980s when he went to court — and won — for the right to move his team from Oakland to Los Angeles. Even after he moved the Raiders back to the Bay Area in 1995, he sued for $1.2 billion to establish that he still owned the rights to the L.A. market. Before that, though, he was a pivotal figure in hastening the merger between the AFL — where he served as commissioner — and the more established NFL. Davis was not initially in favor of a merger, but his aggressive pursuit of NFL players for his fledgling league and team helped bring about the eventual 1970 combination of the two leagues into what is now the most popular sport in the country. "Al Davis was a good man, and we were friendly rivals," Steelers chairman emeritus Dan Rooney said in a statement released by the Steelers. "He was a football man and did a lot for the game of football. I had a lot of respect for him, and he will be missed throughout the entire NFL." Not in the way he dressed — usually satin running suits, one white, one black, and the occasional black suit, black shirt and silver tie. Not in the way he wore his hair — slicked back with a '50s duck-tail. Not in the way he talked — Brooklynese with Southern inflection. Not in the way he did business — on his own terms, always on his own terms. "His contributions and expertise were inspiring at every level — coach, general manager, owner and commissioner," Dallas owner Jerry Jones said. "There was no element of the game of professional football for which Al did not enjoy a thorough and complete level of knowledge and passion." Elected in 1992 to the Pro Football Hall of Fame, Davis was a trailblazer during his half-century in professional football. He hired the first black head coach of the modern era — Art Shell in 1988. He hired the first Latino coach, Tom Flores; and the first woman CEO, Amy Trask. And he was infallibly loyal to his players and officials: to be a Raider was to be a Raider for life. "Everybody realizes that sooner or later, you're going to die. You never expected that from him, because he was so tough," said former Raiders Hall of Famer cornerback Willie Brown. "The things he'd gone through over the years, of course. He's meant a lot to this organization, because he's the leader. It's hard to replace a great leader and a legend like Al Davis." Coach Hue Jackson told the team of Davis' death at a meeting in Houston on Saturday morning. Fans dressed in Raiders jerseys, meanwhile, quickly made their way to team headquarters in Alameda, where a black flag with the team logo flew at half-staff and a makeshift memorial formed at the base of the flag pole. "Definitely shocking news for us," quarterback Jason Campbell said. "We got here last night and then you wake up this morning and hear we lost our owner, the man who built this team for many, many years, it's tough to take in as a team. We understand what he meant to this organization. He loved his players, and that didn't matter if you were here now, or if you played for him 30 years ago. He still loved all his players." People carrying flowers, flags, silver and black pompoms and even a football-shaped balloon stopped by to pay tribute on a warm, crystal clear fall day in the Bay Area. A tiny candle burned as well. "It's like losing a grandfather," said Rob Ybarra of Alameda, who left a bouquet of white flowers shortly after hearing the news of Davis' passing. "He's such an icon. The face of the Raiders. It's hard to put into words how much he meant to everyone." Davis is survived by his wife, Carol, and son Mark, who Davis had said would run the team after his death. Davis was charming, cantankerous and compassionate — a man who when his wife suffered a serious heart attack in the 1970s moved into her hospital room. But he was best known as a rebel, a man who established a team whose silver-and-black colors and pirate logo symbolized his attitude toward authority, both on the field and off. Until the decline of the Raiders into a perennial loser in the first decade of the 21st century he was a winner, the man who as a coach, then owner-general manager-de facto coach, established what he called "the team of the decades" based on another slogan: "commitment to excellence." And the Raiders were excellent, winning three Super Bowls during the 1970s and 1980s and contending almost every other season — an organization filled with castoffs and troublemakers who turned into trouble for opponents. "Al was a football man — his entire life revolved around the game he loved," said Tennessee Titans owner Bud Adams, an original AFL owner of the Houston Oilers. "He worked his way up through the ranks and had a knowledge of all phases of the game. That experience aided him as an owner. He was quite different from every other owner in that way. As an AFL guy, he was in that group of people who pushed our league forward. I didn't get to see him over the last few years and I know many, including myself, will miss him." Born in Brockton, Mass., on July 4, 1929, Davis grew up in Brooklyn and graduated from Erasmus Hall High School, a spawning ground in the two decades after World War II for a number of ambitious young people who became renowned in sports, business and entertainment. Davis was perhaps the second most famous after Barbra Streisand. "We had a reunion in Los Angeles and 500 people showed up, including Bah-bruh," he once told an interviewer in that combination of southern drawl/Brooklynese that was often parodied among his acquaintances within the league and without. A graduate of Syracuse University, he became an assistant coach with the Baltimore Colts at age 24; and was an assistant at The Citadel and then Southern California before joining the Los Angeles Chargers of the new AFL in 1960. Only three years later, he was hired by the Raiders and became the youngest general manager-head coach in pro football history with a team he called "the Raid-uhs" in 1963. He was a good one, 23-16-3 in three seasons with a franchise that had started its life 9-23. Then he bought into the failing franchise, which played on a high school field adjacent to the Nimitz Freeway in Oakland, and became managing general partner, a position he held until his death. But as the many bright young coaches he hired — from John Madden, Mike Shanahan and Jon Gruden to Lane Kiffin — found out, he remained the real coach. He ran everything from the sidelines, often calling down with plays, or sending emissaries to the sidelines to make substitutions. In 1966, he became commissioner of the AFL. But even before that, he had begun to break an unwritten truce between the young league and its established rivals, which fought over draft choices but did not go after established players. Although the NFL's New York Giants' signing of Buffalo placekicker Pete Gogolak marked the first break in that rule, it was Davis who began to go after NFL stars — pursuing quarterbacks John Brodie and Roman Gabriel as he tried to establish AFL supremacy. Davis' war precipitated first talks of merger, although Davis opposed it. But led by Lamar Hunt of Kansas City, the AFL owners agreed that peace was best. A common draft was established, and the first Super Bowl was played following the 1966 season — Green Bay beat Kansas City, then went on to beat Davis' Raiders the next season. By 1970, the leagues were fully merged and the NFL had the basic structure it retains until this day — with Pete Rozelle as commissioner, not Davis, who wanted the job badly. So he went back to the Raiders, running a team that won Super Bowls after the 1976, 1980 and 1983 seasons — the last one in Los Angeles, where the franchise moved in 1982 after protracted court fights. It was a battling bunch, filled with players such as John Matuszak, Mike Haynes, Jim Plunkett and Lyle Alzado, stars who didn't fit in elsewhere who combined with homegrown stars — Ken Stabler, another rebellious spirit; Gene Upshaw; Shell, Jack Tatum, and dozens of others. "He was a pioneer," said Plunkett, who won two Super Bowls with the Raiders. "He did so many things. He was a coach, he was the commissioner of the AFL, became the owner of the Raiders and he ran that club the way he saw fit. He brought in players that everyone else was discarding, including me, and he made it work." After extended lawsuits involving the move to Los Angeles, he went back to Oakland and at one point in the early years of the century was involved in suits in northern and southern California — the one seeking the Los Angeles rights and another suing Oakland for failing to deliver sellouts they promised to get the Raiders back. "Personally, I was fond of him," Bengals owner and president Mike Brown said. "He battled with the NFL, and a lot of us wished that had not been where things went, but under all that was a person I respected. It saddens me to hear that he is gone." The Raiders got to the Super Bowl after the 2002 season, losing to Tampa Bay. But for a long period after that, they had the worst record in the NFL, at one point with five coaches in six years. It is fitting that this year's Raiders team is built in typical Raiders fashion with a bevy of speedsters on offense capable of delivering the deep-strike play Davis always coveted, a physically imposing defensive line that can pressure the quarterback and an accomplished man coverage cornerback in Stanford Routt. He did not appear at a single training camp practice this summer and missed a game in Buffalo last month, believed to be only the third game he missed in 49 seasons with the franchise. Davis did attend Oakland's home game last week against New England. Although he was no longer as public a figure, he was still integrally involved in the team from the draft to negotiating contracts to discussing strategy with his coaches. Jackson has said Davis was unlike any other owner he had worked for in his ability to understand the ins and outs of the game. When his wife was stricken with a heart attack, he moved into her hospital room and lived there for more than a month. And when he heard that even a distant acquaintance was ill, he would offer medical help without worrying about expense. "Disease is the one thing — boy I tell you, it's tough to lick," he said in 2008, talking about the leg ailments that had restricted him to using a walker. "It's tough to lick those diseases. I don't know why they can't." Former AP Football Writer Dave Goldberg and AP Sports Writers Chris Duncan, Janie McCauley, Stephen Hawkins and AP freelance Michael Wagaman contributed to this report. 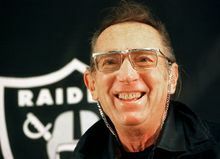 The Oakland Raiders are deeply saddened by the passing of Al Davis. Al Davis was unique, a maverick, a giant among giants, a true legend among legends, the brightest star among stars, a hero, a mentor, a friend. Al Davis was a champion of diversity who maintained the courage of his convictions. His passion for the game we all love is best exemplified by his famous phrase, "COMMITMENT TO EXCELLENCE." The fire that burns brightest in the Raider organization, "THE WILL TO WIN," will continue to blaze through the legacy of the great Al Davis.